Kids love fast food. And the fast food industry definitely loves kids. It couldn’t survive without them. Did you know that the biggest toy company in the world is McDonald’s? It’s true. In fact, one out of every three toys given to a child in the United States each year is from a fast food restaurant.Not only has fast food reached into the toy industry, it’s moving into our schools. One out of every five public schools in the United States now serves brand name fast food. But do kids know what they’re eating? Where do fast food hamburgers come from? And what makes those fries taste so good?When Eric Schlosser’s best-selling book, Fast Food Nation, was published for adults in 2001, many called for his groundbreaking insight to be shared with young people. 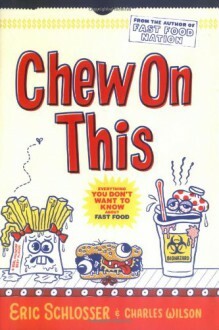 Now Schlosser, along with co-writer Charles Wilson, has investigated the subject further, uncovering new facts children need to know.In Chew On This, they share with kids the fascinating and sometimes frightening truth about what lurks between those sesame seed buns, what a chicken nugget’ really is, and how the fast food industry has been feeding off children for generations.Featuring cover art by M. Wartella.